You can't fault Iphigenia for being a bit glum. Her Dad Agamemnon, an A-lister of Greek Mythology, was all set to offer her as a human sacrifice. Escaping by way of divine intervention she now finds herself stuck in Tauris, unhappily working as a Priestess in Diana's temple and being amorously pursued by King Thoas, who she's doing her best to put in the friend-zone. King Thoas isn't best pleased, threatening to reinstate the old tradition of human sacrifice, and forcing Iphigenia to wield the knife. Things look bad, though a ray of light arrives in the form of Iphiena's long lost brother Orestes and their cousin Pylades. They reveal that everything's gone a bit Jeremy Kyle back home in Mycenae. Agamemnon's wife, Clytemnestra, a bit miffed that he was prepared to murder their daughter, killed her husband. In turn, her children (even more miffed) killed her. Now Orestes is cursed - pursued by the Furies - his only chance to fulfil a challenge of the gods and swipe a statue of Diana from a temple, which is why he's here. Sounds pretty exciting huh? Well, none of that actually happens in this play. This is Goethe's 1779 adaptation of Euripedes 414BCE play, written with an emphasis on poetic language, emotional intensity and philosophical and moral explorations. Okay, I've got to get something out of the way. It gives me no great pleasure to say it and it's a criticism that I don't ever like levelling at a piece of theatre. To say it says as much about me as it does about the play, particularly as Goethe is considered a titan of literature. But here we go: Iphigenia in Tauris is boring. Really, really goddamn boring. I'd never heard of the play before this production, and frankly I can see why. Essentially a series of long-winded, static duologues, the characters go on and on in poetic metre that rapidly approaches incomprehensibility. The language is overwrought, self-indulgent and bulging with self importance. As the characters launch into complex flights of poetic embellishment (full of obscure references to Greek mythology) I felt my eyes glaze over, the dialogue collapsing into a word salad. It'd take an astonishingly talented creative force to pummel this creaky old thing into anything remotely palatable, and this production just isn't up to the task. Perhaps as if to contrast the florid language, the set and costume design is austere to the point of non-existence. The 'half theatre/half archaeological dig' nature of the Rose resists elaborate stagecraft, but an empty, flatly lit stage decorated only by a white sheet doesn't exactly excite the eye. Granted, much appreciated efforts are made to exploit the full space. An altar to Diana is set up at the far back of the room, and the characters periodically scamper across the distant earthern floor. This gives rise to one of the few truly successful dramatic moments; the opening in which an ethereal Iphigenia emerges from the shadows and processes towards us, filling the theatre with her atmospheric voice. I can't really fault the cast too much either, finding myself feeling slightly sorry for them. You can see every dramatic sinew strain as they delve through the soupy dialogue trying to find something - anything - relatable to a modern audience. They're fighting a doomed battle and often, despite their obvious efforts, they end up simply reciting the play. Suzanne Marie as Iphigenia comes out looking best, though even she frequently struggles to locate any glimmer of humanity buried within this mannered poetry. Maybe if you were a scholar of Greek mythology or a particularly big fan of Goethe you'd enjoy this. Otherwise I wouldn't bother: becoming emotionally involved in Iphigenia in Tauris is next to impossible. Being intellectually involved is a little more achievable, though not without enormous effort. And frankly, it's not worth it. 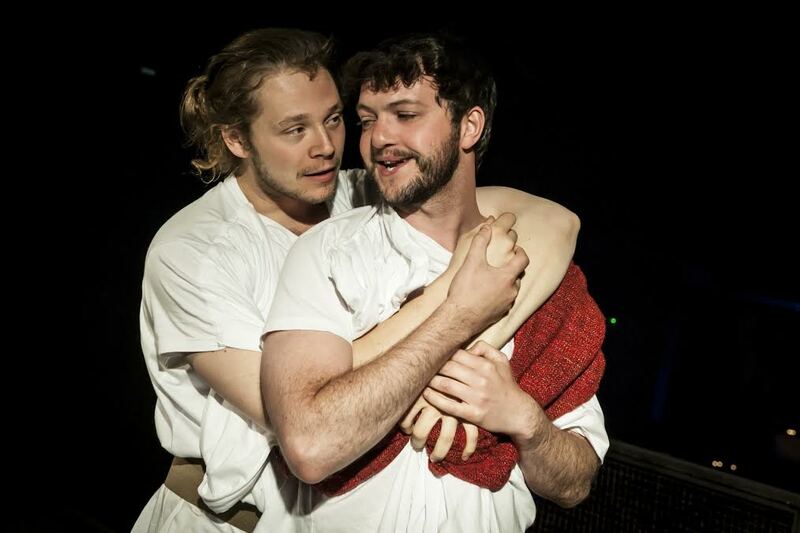 Iphigenia in Tauris is at the Rose Playhouse until 4th July 2015. Tickets here.